Have you ever wanted to feel like a famous football player or goalkeeper? This game is for you! 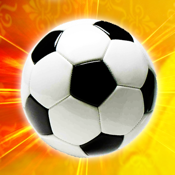 Penalty: Football Championship is a turn based penalty kick game. We give you three different modes. First! You're the goalkeeper and your task is to save as many balls as possible. Second! This time you're the shooter. Enjoy every goal. Third! Take your friend and challenge him! Choose your sides. Show him that he is shooting like a little girl! Or crush him with every goal! YOU HAVE NEVER PLAYED A GAME LIKE THIS ONE BEFORE!